The President of France, Mr Emmanuel Macron, says African governments have to work together to fight terrorism and fix the continent’s problems as France cannot do that for them. Mr Macron said this at a joint news conference with President Muhammadu Buhari inside the Presidential Villa in Abuja after both presidents held talks behind closed doors. “The main plan is an African plan. And France is not the one to solve or fix African situations,” Macron. France is, however, ready to support African countries in combatting terrorism and fixing other challenges and intervening where necessary. “We are still present in the African Sahel to fight against terrorism, especially in Mali and in the region and we will stay for as long as it is requested by our friends,” the French President added. Nigeria and several African countries have battled terrorists for years with varying successes. To effectively tackle insurgency, Macron believes it is important to address the issues encourage people to embrace terrorism. According to him, a lot of people are forced to join terrorist groups because of economic and ethnic crisis. “That is why it is very important to build not just a security approach but a stabilization approach at the same time to provide new opportunities to these people,” he said. 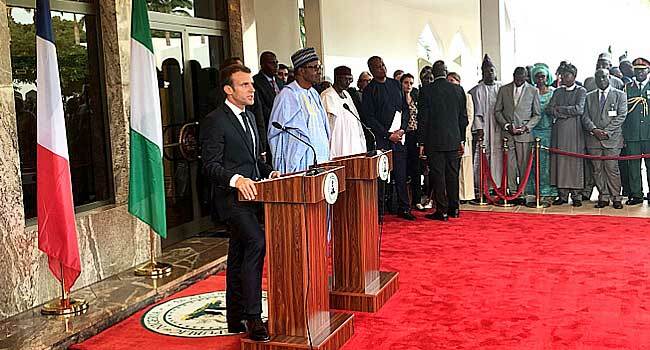 Apart from talks about security, President Buhari said he held talks with the French President on the challenges facing Lake Chad and other issues. “I’m very grateful to France for the support we have been getting,” he said. 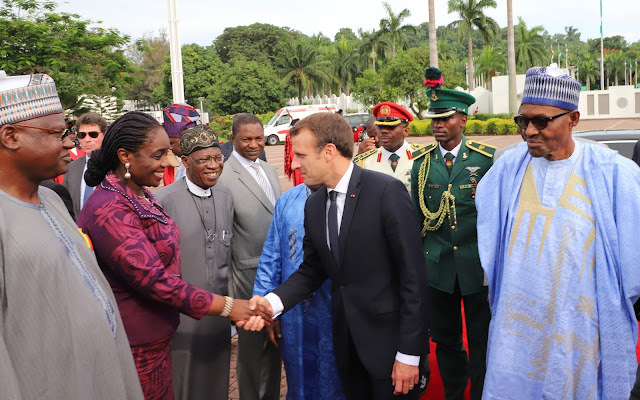 President Buhari also hailed Macron for his scheduled visit to the New Afrika Shrine in Lagos, describing it as “a good idea”. “This is why the Shrine survives. If it were not a good idea people would have forgotten about it,” he said, adding that “people have institutionalized the Shrine because they value it”.